Today’s post is really short and quick. A few weeks ago, I stumbled upon this video of David Lebovitz making chocolate chip cookies (or as the French call it, just cookies) followed by him testing his superior product with Parisians on the street. Not only did I fall in love with David Lebovitz all over again, I had a massive urge to bake cookies then and there! Now, I love chocolate chip cookies. Always have. We never really got them much back home in India but whenever I saw anything baked with chunks of chocolate chips, I had to try it. I am also not much of a baker at all. My last attempt at baking didn’t go exactly as planned. Some tell me its all about one’s cooking style. I’m more of an improvisational cook, while baking involves precise measurements and a certain amount of discipline. After much scouring of the internet and looking for recipes, I came across The BrownEyedBaker’s blog. And good god was I taken aback at the number of cookie recipes she has there! 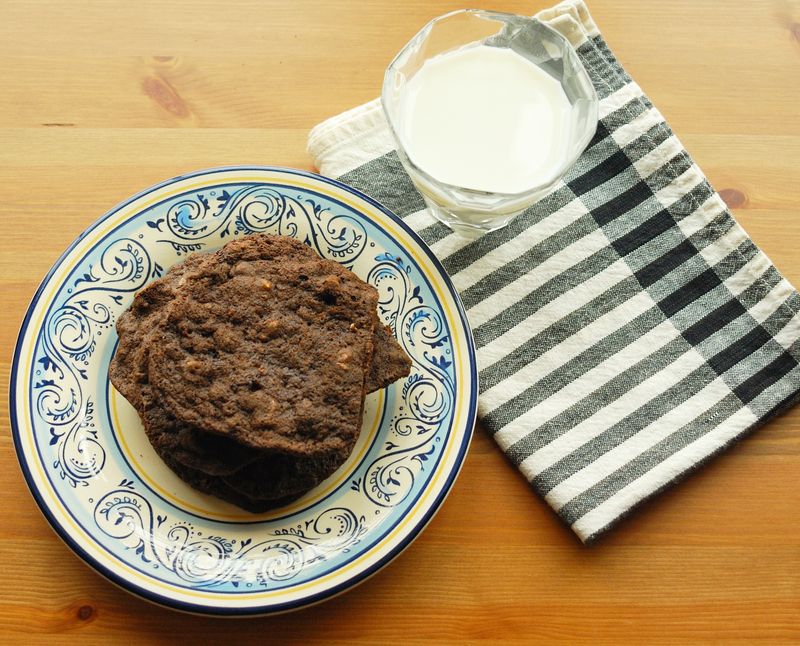 Chocolate fanatic that I am, I was instantly attracted to her recipe for Triple-Chocolate Cookies. I made a few additions and modifications to her recipe. Inspired by David, I added 2 cups of roasted walnuts in the cookie dough. Also, instead of only using semi-sweet chocolate chips, I used a 60-40 mixture of bitter-sweet chocolate chips and semi-sweet chocolate chips. I can’t say my first attempt at baking cookies from scratch was exactly successful but I learned some things along the way that I hope to improve on the next time around. Nevertheless, the cookies were delicious and as Michelle of BrownEyedBaker rightly says, they “pack(ed) a powerful ﻿﻿﻿﻿chocolate punch”. I really enjoyed the process of making cookies and with the lessons I’ve learned, look forward to making them again. Oh sabz, the cookies look amazing! Have any left to share??? ?